At Sound Imaging the number one issue we hear about is patient comfort and safety in the MR suite. Studies show that the human brain responds positively when people listen to their favorite music. So we engineered an MRI-safe sound system for radiologists and their patients that we call MRIStereo.com. The MRI Stereo is a pneumatic stereo system that is made from non-ferromagnetic materials. It is safe to use inside the MRI room, while the technologist monitors the device from the control room. The medical entertainment device can be customized to suit any MRI environment. The MRI Stereo is ready to install, and is already being used by hospitals and imaging centers around the world. The bi-directional feature allows for communication between the technologist and patient during MRI procedures, while also playing music for patient comfort and enjoyment. By creating a comfortable and relaxing environment for the patient, movement from discomfort and anxiety is reduced. This decreases the likelihood of unwanted movement, imaging artifacts and the need for costly rescans. 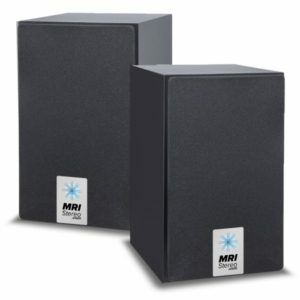 The MRI Stereo comes in a customizable package that caters to each facility. Many accessories are available, including two-way headphones, earbuds, microphones and amplifiers. For sanitation purposes, we offer headphone covers and foam earpieces. We also sell other compatible MRI accessories such as cables and noise guards. 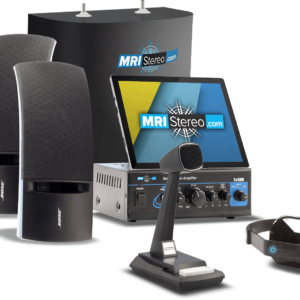 To order a Sound Imaging MRI Stereo, visit our online store, or call (866) 530-7850 for a free quote.